Water is also living proof. "And We created from water every living thing ..." (Al-Quran, Surah Al-Anbiya (21): 30). 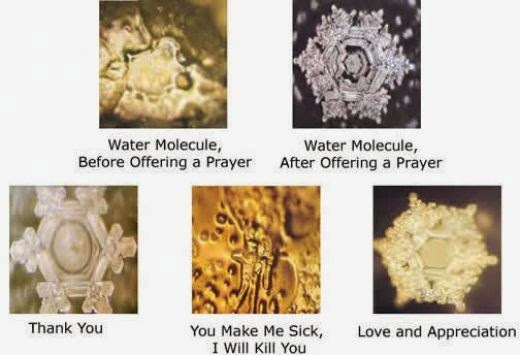 Dr. Masaru Emoto confirmed that the water was alive. Water, like humans, can also hear, see, feel, and respond to any information that we give him. 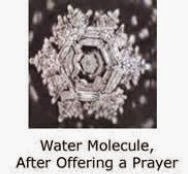 Japanese researchers have proved that water is given a positive response, including prayer, will produce a beautiful crystal form. If a negative response is given, the water will not be able to form crystals. The experiment was repeated by reading the word, Arigato (thank you) in front of the water bottle. Re-formed crystals are very beautiful. Not just with words, the research was continued by writing exposes Arigato Japanese characters. Crystals formed with the same beauty. From the various studies that have been conducted by Dr. Masaru Emoto, he found a variety of common characteristics that cause human disease. In addition, he also found a very close correlation between emotions and organs. In 1995, he held a test Hado (energy that can not be seen) to 100 people. He checked the Hado 100 people based on the type of emotion that often arises (there are 38 types, including stress, worry, depressed, irritable, confused and scared), and then examine the parts of the body where the most to form a resonance with any kind of emotion, table 1 shows Hado's test results. For example, people who feel stress, tend to have problems in the urinary tract. Feelings of worry expressed in cervical nerve problems umbrage disrupt the parasympathetic part of the autonomic nervous system in the excessive fear and anxiety interfere with kidney stomach became ill.
Another lesson that can be learned, the water will respond to what we say and do. Therefore, beware of what you say and do. Therefore, more than 70% of our body consists of water. And bertidaklah said positive and avoid negative to say and act in a body of water you are always pushing you to achieve happiness and peace of life. 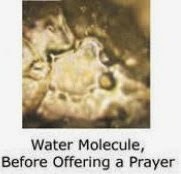 The results of this study, it has been proven that prayer can give effect to the water. And the results of this study are consistent with science. Dr.Masimoto in his research also faound that foods also give positive and negative reactions. The reason why we are encouraged to pray before eating and drinking because it can clearly gives a positive effect on body and mind. now let us always pray before eating and drinking, because obviously our body is made up of 75% water.